Beauty meets function. A contemporary design that offers accessibility features such as an integral grip rail along the length of the bath and optional wood seat. The bath showcases the design capabilities exclusive to KOHLER Cast Iron material. 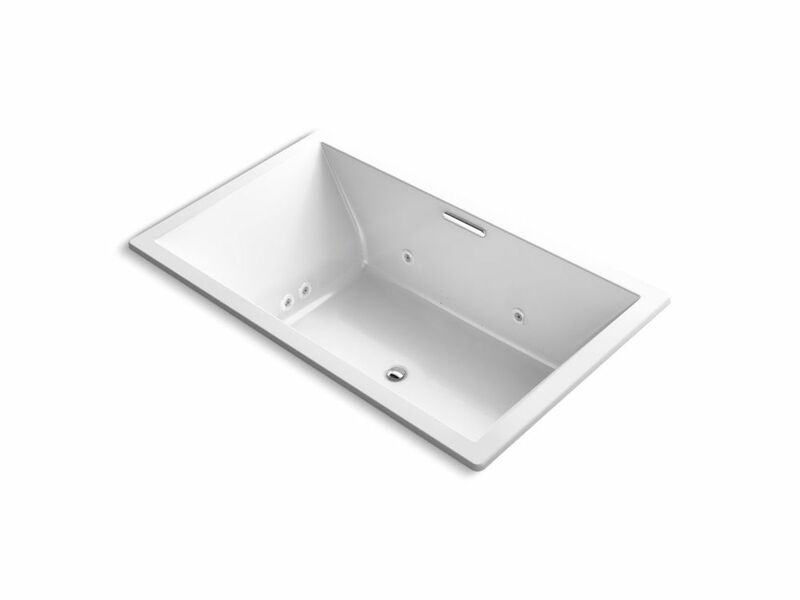 This 5-1/2ft bathtub combines safety with beauty, with its integral grip rail and safeguard slip-resistant surface. Also available in store by special order only see store for details. Underscore 72 inch X 42 inch Drop Inch Whirlpool + Bubblemassage Air Bath With Center Drain In White This Underscore bath offers both a relaxing whirlpool hydromassage and a blissful BubbleMassage experience, with separate keypads to control each independently. Eight adjustable whirlpool jets deliver a powerful hydromassage, while a built-in heater keeps the water at your desired temperature. With BubbleMassage, 122 airjets push air through the water, completely surrounding your body in a blissful cushion of massaging bubbles. The airjets can be targeted to a specific area of your body, or released throughout the bath for an all-over, tension-relieving massage.